Ethiopia is an ancient country with unique cultural heritage and history that dates back at least 3000 years as agreed by several historians. It is a highly diverse country with numerous ethnic groups speaking more than eighty languages. Modern day ethno nationalists tend to politicize the country’s history to favor their political agenda. was deposed by the Derg in 1974. This long tradition of governance was characterized by a centralized administration in which the emperor has the absolute power over any major political decision while regional kings used to govern their respective provinces under the watch of the emperor. Although the Derg radically changed the political system of the country, it decided to continue with a centralized administration. The student movement that eventually led to the downfall of the imperial regime was divided in two camps. There were those that believe the fundamental problem of the country emanates from class inequality, represented by the Ethiopian People’s Revolutionary Party (EPRP) and the All-Ethiopia Socialist Movement (MEISON), while the other group that includes the Eritrean People’s Liberation Front (EPLF), the Tigrayan People’s Liberation Front (TPLF) and the Oromo People’s Liberation Front (OLF); held the view that equality among the various ethnic groups and the right for self determination is the crucial question that should be addressed in order to bring about a stable and unified country. Despite these contradictions, all of them advocated communism as their ideology. In 1991, the military junta was overthrown by the TPLF that originally waged a war to separate Tigray from the rest of Ethiopia as indicated in its 1976 manifesto. The new regime under the TPLF/EPRDF introduced a new constitution which became the basis to divide the country into nine ethnic based regions or “kilils” as it is known in Amharic. According to the ruling party, the idea behind this system is that each ethnic group has the right to administer its region, develop its language and culture and have the right to self determination. However, ethnic federalism has proved to be a venomous project designed to disintegrate the country gradually into smaller states as it has been witnessed over the past quarter of a century. Article 39 of the constitution states that, “every nation, nationality or people in Ethiopia shall have the unrestricted right to self determination up to secession.” This means that if any of these ethnic based regions choose to separate from Ethiopia, the constitution provides them the legal basis to do so. It is probably the only constitution in the world that promotes the disintegration of the country deliberately. 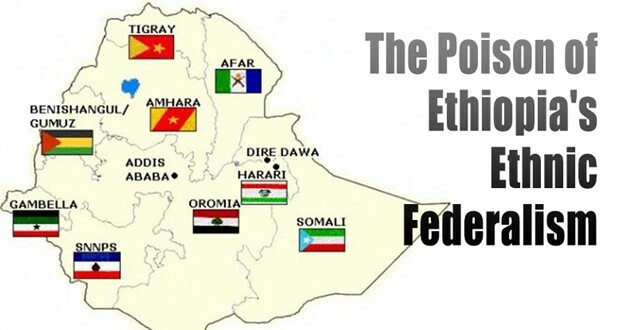 Since the TPLF/EPRDF took control of Ethiopia and implemented ethnic federalism, the country’s unity and territorial integrity has been seriously threatened and hatred and mistrust among various ethnics groups has grown. The ruling party encourages ethnic based opposition while eliminating parties that advocate Ethiopian nationalism. This has been its strategy to continue its divide and rule policy. Various studies show that ethnic federalism is an obstacle to equitable growth and development. This is because it restricts the movement labor, capital and knowledge. A practical example would be a person from the capital Addis Ababa who wants to start up a business in Oromia is expected to speak Oromiffa, otherwise the regional government may not allow them to run their business in the region even though Amharic is the national language of the country. This clearly has adverse effects on the country’s economy as a whole since citizens are unable to share their knowledge or invest their capital without any restriction. Likewise, if a person wants to have a government position in a region that he/she does not speak the local language, then they are barred from holding that position. This means that citizens are not evaluated based on their merits but on their ethnic identities which is not only wrong and detrimental but embarrassingly backward as well. In addition to this, ethnic federalism creates inconvenience for citizens regarding some administrative or legal issues. For instance, a person living in Debre Birhan has to travel all the way to Bahir Dar (more than eight hours) to attend a hearing at the Supreme Court because regional Supreme Courts sit at the capitals of the respective regions. Regional governments do not have real power in administering their regions contrary to the constitution. It is clear that members of the TPLF are the ones behind the throne of these puppet governments making major political decisions. Ethnic cleaning is another product of this system. Over the past several years, Amharas living in various parts of the country have been the victim of ethnic cleaning. Thousands of people were forced leave from some regions such as Benishangul-Gumuz and Gambela although most of these people were born and raised in these regions. Similarly, residents of the Wolkait-Tegede region have also been a victim of ethnic cleaning as the TPLF dominated government has gradually evicted them out of their land to expand the region of Tigray. 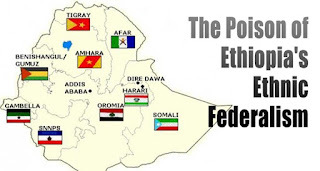 All this indicates that ethnic federalism has miserably failed in Ethiopia. In general, ethnic federalism is a dangerous system that threatens the unity of the country that has been built over the past three millennia. Moreover, the country’s very existence is in question the longer this disastrous system stays in place.